Want to get your day started with something a little unique? Music in the Morning has been entertaining audiences since 1985 with its unique series of, well, music in the morning. This week, one of the most dynamic chamber music ensembles on the classical music scene today, Trio Céleste performs Antonin Dvorak’s Piano Trio No. 4, the Dumky Trio, and Beethoven’s Piano Trio in Bb Major. More information at musicinthemorning.org. California-based Trio Céleste makes their Music in the Morning debut. Love is in the air as the Vancouver TheatreSports League brings a whole week of romance-themed improv to the stage. Forget the chocolates and the flowers; this year it is all about the laughs. More information at vtsl.com. Celebrate the fun and funny in relationships and romance at this year’s Romance Week. Your best bet on stage right now is what our reviewer called “simply good theatre”. The women of Classic Chic Productions take on one of Shakespeare’s much-loved comedies with spectacular results. More information at thecultch.com. 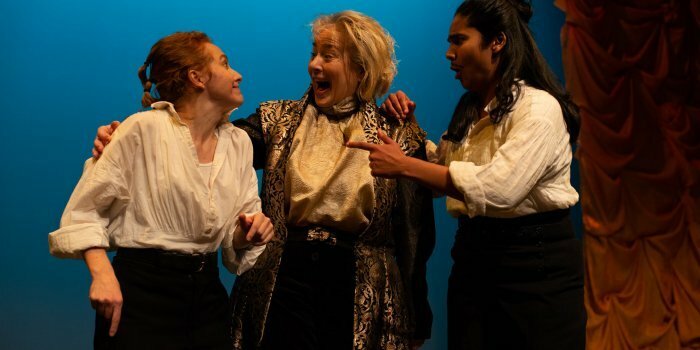 Kayla Deorksen, Barbara Pollard, Adele Noronha in the Classic Chic Productions presentation of Much Ado About Nothing.